Before you delete this post, let me assure you that I’m not going to suggest, a potion, exercise, supplement or on-line service to help you improve your memory. I don’t hawk products on this site, heck, I even pay for a premium deal so I can eliminate ads. No, this post is all about the fact that there are certain things that I just can’t seem to remember. Ever. Not just things like ‘accommodate’ has two Cs and two Ms, or the “when I need”, and particularly “when I don’t need” a comma. I’m talking about more basic and simple things. 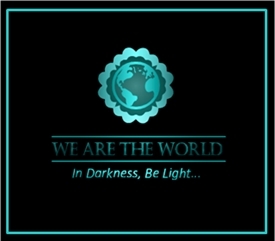 Things like locking the door or turning out the outside lights. Those two are self-correcting, in that when my wife gets up to turn out the lights, she checks the door. Earlier this winter, I thought about ordering a space heater for my office. Our office is not evenly heated, and my space tends to be cold in the winter and hot in the summer. I resisted the urge for two reasons: 1) The building management doesn’t want us to use space heaters, and 2) I was worried that I’d forget to turn it off. After arriving to work during a cold snap and finding my office to be 62°f (16.6°c) a few Mondays ago, I ordered the space heater. When it arrived, I was so cold, and I quickly unpacked it, plugged it in and set it on ‘High’ – ‘High Fan’ – ‘Swivel’ and I set the instructions aside. I had heat now, I didn’t need to know anything else. I told my wife about the heater and she asked me if I turned it off. I quite proudly announced that I had. Fortunately, one of my coworkers works a 9:00 – 5:00 schedule (I work 7:00 – 3:00). I sent him a quick text message, asking if he would shut off my heater. He also informed me that he has the same heater in his office and that the setting I ignored, is a timer. After reading the manual the next day, I realized that the adjustment I assumed was ‘Hi’ or ‘Lo’, is actually ‘Hi’ or numbers. Now, when I turn the heater on, I set it to 70°f (21.1°c) and I set it to turn off in 8 hours. I can remember that. After I set the heater to the desired temp, it shows me the current temp. This is not a good temperature for working. It’s Here! – I need this. And, yes, all of the features are described on the box. A little warmer this morning. This post is part of Linda G. Hill’s fun weekly series One-Liner Wednesday and, since I was able to incorporate “It’s here” into one of the photos, #JusJoJan as well. Thanks Teagan. Warm in under control. At least until the Building Manager complains. Glad to hear it. LOL, keep a sharp eye out! “HI” back atcha. Stay nice and toasty! With my swiss-cheese brain I can well appreciate this post!! Ha ha – I do feel better knowing that I won’t set the place on fire. Thanks Judy. When I take Maddie for a walk, if my wife isn’t home, I have to take a key. It’s the hardest thing to remember. Then again, if you’re going to be locked ut, the beach isn’t so bad. I hope you enjoy the back half of this week. Ha! I have the same problem with my bedroom, so last winter I bought a heater. I also have to remember to turn it off or unplug it before going to work. I forgot one or two days, but I had it set to a low enough temp that I didn’t make the cats sweat. My heater doesn’t have a timer, but it does turn itself off if it’s moved or falls over. Enjoy the warmth Dan. You only have two more months of winter and then you can put it away. Thanks Mary. Of course, I’ll probably go in the first day we’re in the 70s and turn the heater on, ‘cuz habit by then. I really tried to resist, but being cold at your desk in the office is just the worst. Oh, I get the cold thing, especially if you’re expected to work with chattering teeth. It’s funny how I need a heater when the bedroom is 62 degrees, but consider it good “sleeping weather” in the summer when the temps are in the 50’s and windows are wide open. What’s up with that? Ha ha – I don’t know. I prefer the bedroom cool, but I sleep under a pile of blankets. I just love getting warm. Oh, Dan—I work in Risk Management and we have such a problem with space heaters in our office for the exact reason you state–people forget to turn them off. 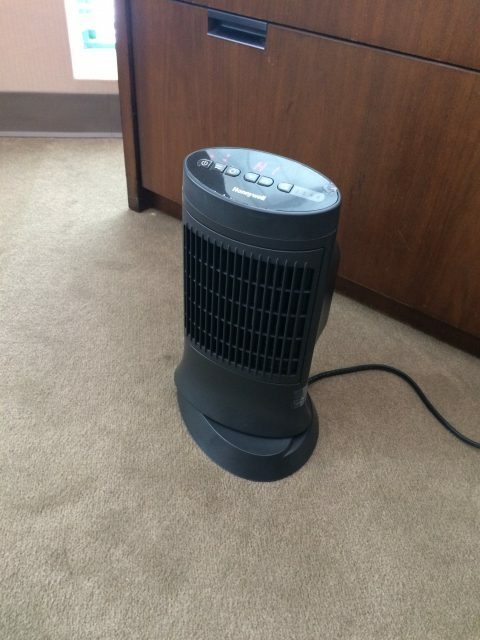 Although…..the supervisor’s office stays cold so she did buy a space heater. And…you guessed it….forgets to turn it off. We have since stopped issuing mandates about no space heaters in the office. This was a fun post. I’m glad you liked this, and I don’t envy you your job, Lois. Our building has changed hands and management companies several times. Most of them are fine. One group was a bit hard-nosed about the heaters, until I started tracking the temperature and reminding them of the part of the lease that says they will keep the office at a comfortable can’t, so it’s an issue we all have to live with. But wait…you’re in Florida. Are the heaters on for cool days, or working against the AC? Both! On colder days like we are having this week, the a/c still cranks on and we have to complain to management to please knock it off. Heat on. In the summer, a/c blasts. Heat on. Our building is like yours–hot and cold spots throughout. My department is one of the cold spots. We have been having lows in the 40s! Brr-rr!! I’m glad you’ve found a way to warm your office. The timer is a very handy feature. I’m borderline neurotic about remembering to switch things off but my husband and four sons are not so timers on more things would alleviate me of the burden of reminding them. Working in cold spaces is abysmal, isn’t it? I find I cannot concentrate as much as I should be because my physical discomfort is distracting. And doing anything with my hands is slow going because my fingers refuse to work properly when cold. Timers are wonderful. If I lived alone, I think I’d put everything on a timer. Working in my workshop, in the winter, I’m happy if I get the shop into the 50s, but I’m in jeans and a heavy shirt and a Carhart vest. And, I’m moving. Sitting at a desk, I feel like I’m gradually reaching equilibrium with the room. 62 was simply too cold to concentrate. Even my coffee didn’t stay hot. I love my big space heater at home, which I always turn off. I compulsively check it every time I leave or go to bed, honestly. At work I am the one WITHOUT a space heater and I am so grateful! lol Every time I leave my office I get hot! They even run them in the summer! We have folks running space heaters in the summer, but the AC is as bad as the heat. 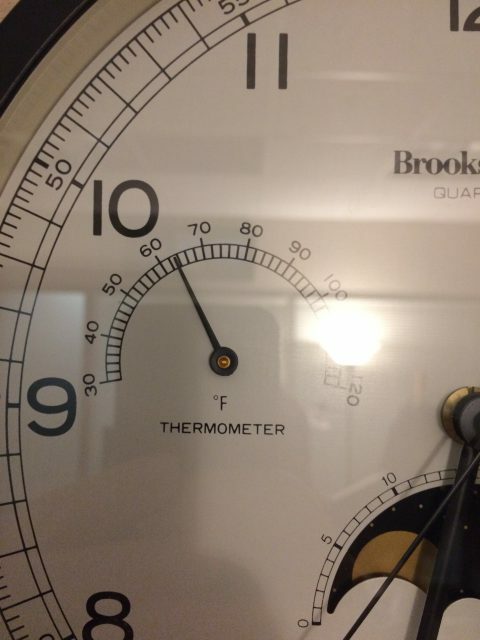 My office has been known to get to 80 in the summer while other areas are in the 60s. I can walk away from anything and leave it running. I’m just not wiredthat way. Phew! 80! *pants* no thanks! Hi Dan. The memory thing only gets worse with age. I leave myself little clues all the time to jog my memory. My worst instance was putting the large iron skillet on the gas stove to dry it out and then forgetting it. Eventually the smell of hot iron permeates the house. In November my little space heater that I would move from room to room died. I kept saying I need to get another one but didn’t buy one. For Christmas each of my children gave me a space heater! They were so bummed out that the other had also gifted me one, but I was so happy! I have two now one I move from the living room to the family room, and one I keep in my retreat. Huh, I just realized looking at the one going on HI right next me has a timer! I’ll have to dig out the manual and figure out how to set that up. Thanks, I probably wouldn’t have ever read the manual otherwise! :) I’ll check out the other space heater too to see if it has a timer. They both came with remotes. I love that! Ha ha – I’m glad to be in good company regarding those manuals. Mine doesn’t have a remote. That’s probably a good thing. Wow. Six hours to get up to temp and you only have two hours to go. I think you have a case for workers comp. Enjoyed it. Like the moon phase too. Thanks John. That day, the outside temp never made it out of the teens. The clock is a funny story. It’s not mine. The previous occupant of the office bought it, but everybody looks at it as they walk into the kitchen. When he took it down and tried to pack it (when he retired) people complained. He gave it to me, but told me that I have to give it to the next person when I retire. Great story. It is informative. What is the other dial? Barometer? Two thoughts….love the space heater for the office…I had (yes had) one here in my home office last year…it has left the building…can’t find it this year….miss the little guy…and yes we do get cold (ok chilly) here in Arizona….second thing….ever drive a few blocks from your home and ask yourself…”Did I close the garage door?”…hate when that happens!! I hold you find your heater, Kirt. As for the garage door, I’ve driven around the block more than a few times, and I’ve called my wife once or twice. That might be the one “smart” device I would like. The garage door opener whose status I can check from my phone. Stay warm and safe, Dan. Also, I am worried about you as I saw your picture where you have injured fingers. Are you doing good? What’s the status of the injury? Automation has improved my memory considerably. I remember those days of freezing cold offices! There were always “those people” who remained inexplicably warm while the rest of us were suffering (and, they always seem to have control over the thermostat). Stay warm! I was gonna say, doesn’t the heater have a timer on it? It’ll take some time to adjust, but it’s worth it. My mother-in-law uses a space heater in her living room. When she’s up walking around and doing stuff in the home, she likes the temperature at 67 degrees. However, when she sits to watch a program, even a stadium blanket won’t keep her warm without the help of the space heater. My husband says I like it too warm in the house [70 degrees]. Maybe I should get one of these heaters so he can have the temperature lower. I say we leave the heaters on, John. It will be nice to come back to a warm place, and what’s the chances the place will catch on fire? I need every part of my life to have an automatic shut-off. Then nothing would be forgotten. Just this morning I was making oatmeal and had the stove on low while the oatmeal cooked down. I ate my breakfast and over 30 minutes past before my husband came home from work not feeling well, and asked me if there was a reason the stove was on. My stove would be the first place I would install a timer. Of course, not for 8 hours, but more like 15 minutes. Yes, this would work fine. Good thing we have spouses -huh! Agreed – on both counts. I have a heater in my office, as well. I haven’t paid attention to who made it. I’m just thankful it keeps my fingertips warm. Ugh, when my hands are cold, work stops. It doesn’t matter what the work is. of course we read directions once we start using it – that is how it goes. hha! and we love our little heaters- we have a bonus room that gets a chill – and love the little help. But I have gotten into the habit of unplugging it because so many house fires have been started by such heaters. and cool that yours has a timer…. If not for that timer, I fear I’d already be in the news. I never woulda thunk it dan! 😀We all have our kryptonite. Glad you found a way to keep warm. Saved by a coworker!! Now you have me wondering if there are timers on our space heaters. We don’t use them very often, but it’s nice to have them! Saved indeed, Joanne. Otherwise, my wife would have made me drive back to the office. I had left it on ‘Hi’ so that would have been a bad thing. I’m guessing the little space heater is earning brownie points!